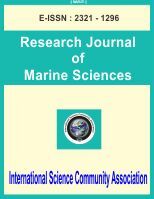 International Science Community Association are publishing an international peer reviewed journal Research Journal of Marine Sciences . It is the vision of International Science Community Association to publish research papers, research articles, review papers, mini review, case study and short commutations in all areas of human study without financial restriction. Coverage Area: Researches in the field of Marine Sciences which including marine science, marine engineering, marine instrumentation, marine ecology, marine architecture, marine archaeology, Education and training in marine sciences, marine sanctuary management, new development model of marine interest programs, marine education research, marine and freshwater research, marine environmental processes and issues, marine policy and law, marine economics, Socio economy, marine geology, marine georesources and geotechnology, marine biology, marine geodesy, Oceanography of marine, satellite oceanography, ocean engineering, ocean modeling or climate change, theoretical and applied climatology, marine weather and forecasting, remote sensing of environment, Biodiversity in varying environments, living marine resources, management and protection of living marine resources, marine organisms and ecosystem, marine habitats, marine fungi, marine mammal, marine reptile, marine invertebrates, marine conservation, marine adaptations, marine biomolecules and biomimetic materials, marine energy, marine current and marine power system, kinetic energy of marine currents, hydrology, deep Sea Research and trenches, coastal waters, coastal zone management systems, Integrated and sustainable ecosystem conservation and management, continental shelf, Brackish water and lagoon environment, brackish water and estuarine/ transitional systems, Effects of waste disposal and anthropogenic pressures, benthic and estuarine sedimentary processes, etc.